The Smith and Wesson M&P 15/22 rifle is a .22lr caliber weapon in the popular AR-15 form factor. The public sometimes infers that “AR” in the name stands for Assault Rifle, but it actually came from the original manufacturer, and stands for Armalite Rifle. The pistol in this image is the Ruger SR22. What really baffles me is the idea that “assault rifle” is bad at all. If I had one (and I would love to have one), I wouldn’t hesitate to own the term. After all, many of us admire those who use these weapons, and see them as good guys most of the time. We regard Army Rangers and Navy SEALs as heroes. We laud police and their SWAT teams across the country as the honorable guardians of peace and justice (in spite of the fact that this is not always true – some cops are just bullies.) Our admiration is probably the real reason we love assault rifles so much. Delta Force guys with their M4s just look cool. Often lately we see the media capitulating to the pressure of the NRA or the TEA Party and using the term “assault-style rifle,” which in my opinion is even worse. Style has nothing to do with it. It’s all about purpose. A weapon with a short or medium barrel, making the weapon better suited to close quarters combat (CQB) and short to medium range engagements. A weapon designed to accept differently sized ammunition magazines for various purposes. The gun community likes to point out that 30-round magazines are “standard capacity” magazines, not “high capacity” as the media likes to call them. 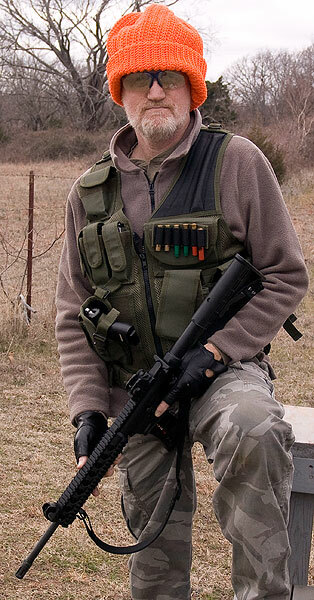 I would assert that 30-round magazines are standard capacity for military and police tactics. Such magazines are designed to be changed in just a few seconds. These weapons use ammunition types that were originally created for anti-personnel purposes, rather than hunting or competition. The most popular of these are the 5.56mm and 7.62mm NATO rounds. Neither was created for hunting or target shooting. Laws over the years have added folding or adjustable stocks, pistol grips, and muzzle devices like flash hiders and suppressors, but I don’t see those as specific to assault rifles. Another YouTuber commented that the defining characteristics of an assault rifle are selective fire and an intermediate cartridge, but I strongly disagree with the selective fire argument. Selective fire means that the shooter can switch between semi-automatic (one trigger pull equals one shot fired) and fully-automatic (pulling the trigger means shots are fired continuously until the trigger is released.) Many military and almost all police assault rifles are semi-automatic only, because fully automatic weapons are not particularly effective in the CQB/assault role. They are typically used for area denial and enemy fire suppression. This same YouTuber called these firearms, “MSR, or Modern Sporting Rifle.” I would only agree to that term if you include military and police tactics as a sport, which, actually, I do. That brings us around to the original point, that the term assault rifle describes these weapons, and in spite of a nervous, ignorant public and a manipulative national media, that isn’t a bad thing at all. 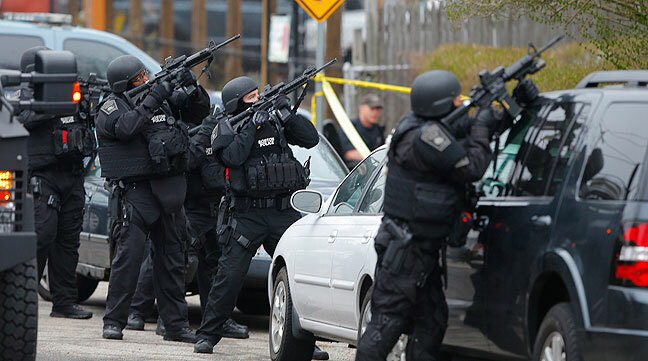 Police officers take position during a search for the Boston Marathon bombing suspects in Watertown, Massachusetts April 19, 2013. It’s quite a stretch to look at their weapons and think they are designed for anything other than military and police tactics, and are thus assault rifles. I assume the reason that “assault rifle” is used so often in a negative way (by the media) and thus has gun owners on their heels is the basic dichotomy between the two belief systems. Using the Second Amendment won’t work against a true-blue liberal; they’ve already convinced themselves it referred only to organized militias (thus the comma argument). The self-defense argument also doesn’t work for them. But “shooting as a past time” or “family tradition of hunting” and so on actually gives the thoughtful liberal journalist little to argue against. So, they’ve divided guns into categories: (1) the kind that we’ll try to ban later, and (2) the kind we can try to ban now. The second category includes the evil sounding “assault rifle”, because (they think) the gun owner is on very weak ground when defending ownership of such a weapon.